Roast the sooji in 1 tsp ghee lightly and keep aside. Now in remaining ghee roast the besan on low flame till a nice aroma comes from it. To this add the powdered sugar and roasted sooji and crushed cardamom and mix well. Remove from fire. While the mix is hot add the chopped almonds. Form ladoos while the mixture is still hot or else ladoos will not be formed. 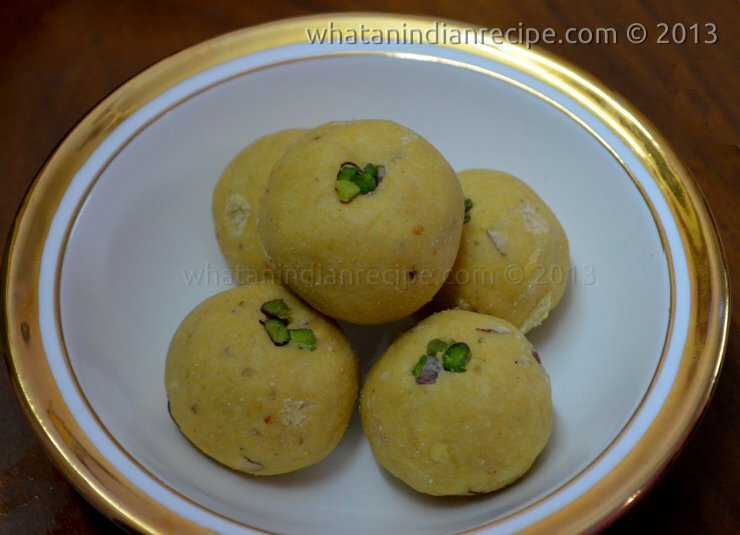 If you have problem forming small balls then grase ur hands with a little ghee and then for the ladoos. While forming ladoos take 2-3 pieces of chopped pista and press it on the ladoos.